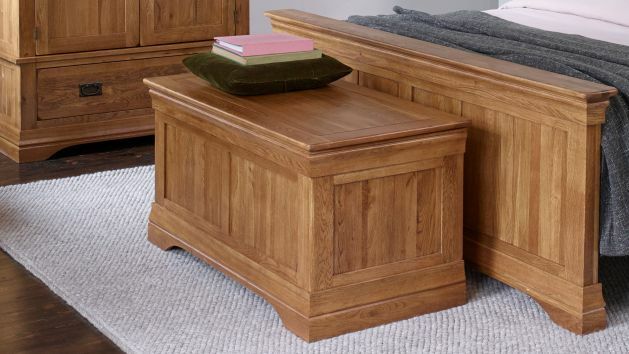 Our beautiful solid oak blanket boxes provide stylish storage in your living room or bedroom. With plenty of finishes and styles, you'll find your perfect look! Our beautiful solid oak blanket boxes are designed to bring stylish storage into your bedroom or living room. Made from 100% solid hardwood, they will stand up to whatever you store in them, whether it's used to help tidy children's toys in the living room, storing spare blankets and throws when not required, or as an oversized shoe box in your bedroom. We have lots of styles available, from the sleek modern looks of our Oakdale blanket box, to the traditional and timeless elegance of our Classic collection. Each piece is finished in either our rustic or natural wax finish to protect the wood, and add to the striking good looks. Our natural finish adds a bright and airy feeling to the oak, while the rustic wax embraces deeper honeyed tones for a county feel. Browse all our stunning blanket boxes below, in gorgeous solid oak!